In these interesting times, Mother Gaia is calling us to remember the sacredness of all around us, including her as our Planetary Caretaker. Our gardens are not only therapeutic spaces but where we can most intimately rekindle a deeper relationship and reverence for all life around us — so needed at this time. Come join us for a deeply restorative day of healing and sacred connection. We will tap into Gaia’s wisdom and learn practices that will encourage us to infuse your gardening and our lives with a deeper sense of love and connection with all that we do AND all around us. 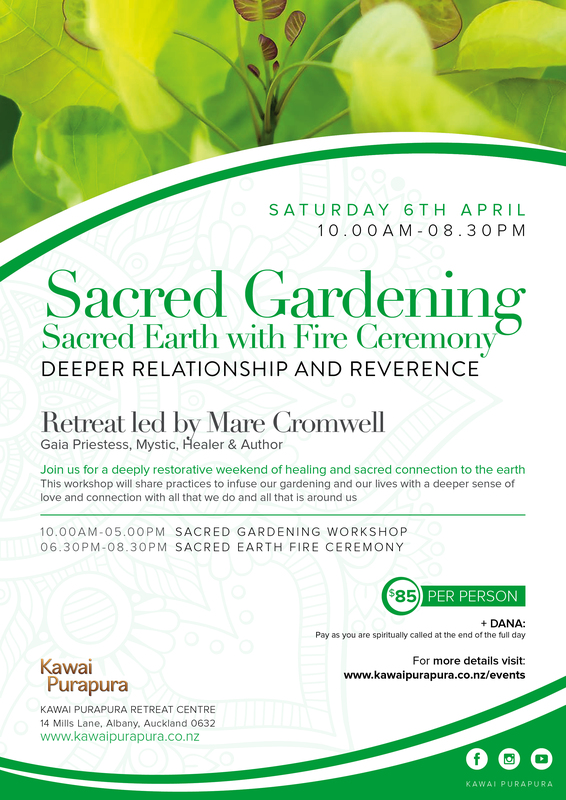 You will learn about connecting with the spirit of the land, sacred gardening practices and planetary healing. This workshop sources from Mare Cromwell’s over 23 years of studies with Native American teachers and other spiritual mentors and her direct communications with Mother Gaia, the nature spirits/elementals, trees and more. Mare has been told by one gifted Native American elder that her work with Mother Gaia is in the prophecies. Another gifted elder called her the “Voice of Earth Mother”. “Mare Cromwell is not a mere person, she is an experience; a living, breathing manifestation of the love of Mother Gaia herself. She is the Shield Priestess of Gaia – a woman on a sacred mission to teach others to embrace their Divine center connected to Gaia within themselves.” ~ K.H. “I will never forget the Sacred Gardening workshop of yours I went to several years ago. Your teachings stayed with me in a glorious way and I am very grateful for what you offered.” ~ A.M.
“Nothing like healing, learning and reflecting in beautiful surroundings with loving and spiritual people and an amazing teacher! Thank you, Mare Cromwell, for a fantastic experience.” ~ B.H. “Mare brings a compassionate balance of healership to her workshops. I love her ability to see my shadows and my light with unconditional love and encourage me on my healing journey. Rest assured she is a true Earth Walker very in tune with Earth’s wisdom. I hope you will be blessed by her grace and compassion as I have! She is a true gift of humanity.” ~ C.P. Then pay whatever you are called to pay at the end of the retreat, according to what you feel you’ve received from it. Mare’s goal is to make this event available to those of varying income levels. To Register send funds to this link. Referred to as “The Voice of Earth Mother” by the gifted Shoshone elder, Bennie LeBeau/Rainbow Thunder Heart, Mare Cromwell is a Gaia Communicator & Priestess, Visionary , Healer and Author. Some might call her a Medicine Woman. Her books include: The Great Mother Bible; Messages from Mother…. Earth Mother; and If I gave you God’s phone number. She has studied with Native American teachers for twenty-three years along with other gifted spiritual mentors, and sat on the World Council for Wisdom Gatherings for three years. Mare leads workshops on our Sacred Planet-Earth Mother, Womb Wisdom and the Divine Masculine, and other related topics. She is also the visionary and producer of the 1000 Goddesses Gathering & Global Grid. She loves to be involved in Sacred Water and Fire Ceremonies. Mare is also a former worm herder. She calls Western Maryland home.